A large, mounted wall hanging of a common loon greets visitors to Amy McMillan’s lab in the Science and Mathematics Complex. The piece was a gift from one of the first undergraduate students she mentored after joining the Biology Department in 2003. 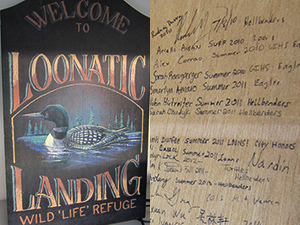 Every year since, young scholars completing research under McMillan’s watchful guidance sign the back of the picture, which now boasts scores of signatures and is nearly full. 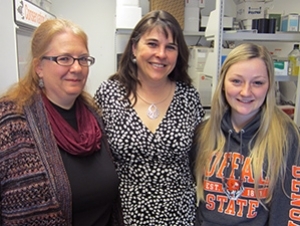 Since it was formally established in 2003, the college’s Undergraduate Research Office has guided thousands of Buffalo State students from all academic disciplines through projects ranging from research, scholarly, and creative activities integrated into individual courses, semester-long independent projects, and summer fellowships. While the duration may vary, these intensive examinations all involve meaningful student-mentor interaction. This week, students from across the campus will present their preliminary and completed research, scholarly, and creative activities at the 18th annual Student Research and Creativity Celebration. “The value of the relationship that develops between students and mentors cannot be underestimated and can lead to transformative changes in the student, although mentors also benefit greatly from these interactions,” said Jill Singer, director of the Undergraduate Research Office, professor of earth sciences and science education, and Council on Undergraduate Research (CUR) Fellow. Mentoring can develop lasting professional relationships that go beyond the research itself to bloom into full academic partnerships. Many alumni whose first research experience was completed as undergraduates have gone on to advanced degrees and, in some cases, returned to their alma mater to teach, mentor, and lead. McMillan didn’t have to wait long to fulfill that promise. 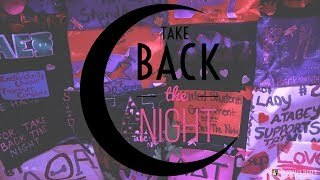 One week after arriving at Buffalo State, an undergraduate walked into her office looking for guidance. In a twist, the student’s search for a mentor would completely alter the path of McMillan’s own research. Together, Foster and McMillan have co-authored several articles on their findings, which have helped lead New York State and the U.S. Fish and Wildlife Service to consider listing hellbenders as an endangered species. After earning a degree in education, Foster spent several years teaching at elementary schools. When an opportunity to return to college appeared, she jumped at the chance and decided to revisit her passion for wildlife conservation as a biology major. A professor suggested she contact the department’s then newly hired faculty member, McMillan, who had a background in zoology and ecology. With McMillan’s encouragement, Foster applied for and was awarded an Undergraduate Summer Research Fellowship in 2003. In her senior year, she studied the effects of mercury contamination on the Bald Eagle and the Belted Kingfisher population. The experience proved life-changing and Foster decided to pursue her master’s degree in biology at Buffalo State. Meanwhile, McMillan had been reading about the plight of the hellbender, a large salamander found in New York State’s Susquehanna and Allegheny rivers, which had seen a rapid population decline since the 1980s. The hellbenders’ dwindling numbers were indicative of poor water quality in the region. McMillan shared her discovery with Foster who immediately connected with the research possibilities and used it as the basis for her master’s thesis. 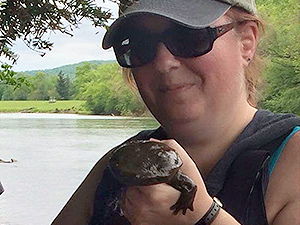 Foster has continued her examination of hellbenders as a doctoral candidate at the University at Buffalo, as part of the New York State Hellbender Work Group and, recently, as a mentor to undergraduate students. One of the hurdles undergraduate mentors face is instilling confidence in their students. Many first-time researchers are naturally concerned about obtaining desirable outcomes, being thorough, and, simply, making mistakes. 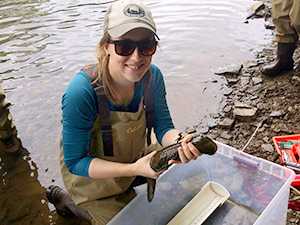 On the first day of her eight-week Undergraduate Summer Research Fellowship studying hellbenders in the Susquehanna watershed, senior biology major Megan Kocher felt she had already ruined her research project. Kocher, along with fellow biology majors Shelby Priester and Sonya Bayba, were establishing sampling points to collect data. After the short stumble of the first day’s field research, the student group faced a larger challenge—near constant rain. While some undergraduate students fret about project outcomes, they may not realize one of the essential results of research until it has already happened—self-discovery. 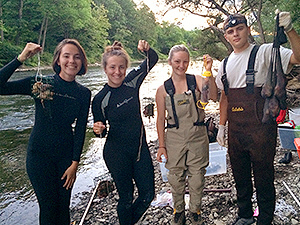 Kocher, who is set to graduate in December, learned that while she loved her field research experience, she’s not suited to the hours of lab time required to analyze data. She’s considering her options after graduation, but already has a good idea of what she’d like to do. Alternately, Kocher’s research partner, Shelby Priester, has gained the confidence and expertise to consider research as a full-time path. 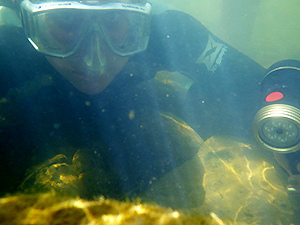 Last summer’s project studying hellbenders was Priester’s first research experience—it clicked. Priester is currently applying for field-oriented summer research jobs all over the country. After she graduates in 2017, she plans to pursue a graduate degree in biology, zoology, or wildlife conservation. Foster and McMillan revel in the transformations their students have made, but are not altogether surprised. And so it has for countless Buffalo State students. Third from bottom: Field crew getting ready to set bait for a night survey. From left: Bayba, Kocher, Priester, and NYS DEC wildlife technician Seth Liddle.